Hamentaschen for sale. Buy online at Zingerman's Mail Order. Gourmet Gifts. Food Gifts. Purim's prize all year long. 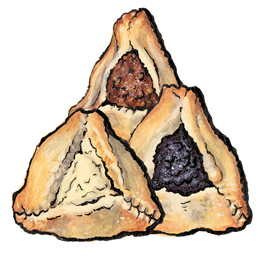 Hamentaschen are wonderfully scrumptious triangle-shaped, open faced cookie dough pastries usually eaten during the Jewish celebration of Purim. The rest of the year they usually disappear. It's clear Purim is much too brief a holiday to get your fill so we're making a move to bake them all year long. We load the simple real-butter and organic flour dough with an assortment of traditional fillings: vanilla bean cream cheese, poppy seed, and apricot. You can skip the tradition and eat them when you'd like: Thanksgiving, Christmas, Mardi Gras, St. Patrick's Day, whenever.